This is an internationally recognised state-of-the-art facility for materials testing, particularly the fatigue testing of aircraft structures. It was named after the pioneering Australian fatigue test scientist, H. A. "Arthur" Wills. The research work involves the testing of small coupons and aircraft components, through to placing actual airframe structures in large purpose built rigs fitted with hydraulic, electrical and/or pneumatic actuators that apply forces to simulate the loads that an airframe typically experiences in flight. The number and types of loads are equated to flying hours so that when cracks appear in the test, the time in the test can be used to estimate the time at which cracking may occur in the fleet. 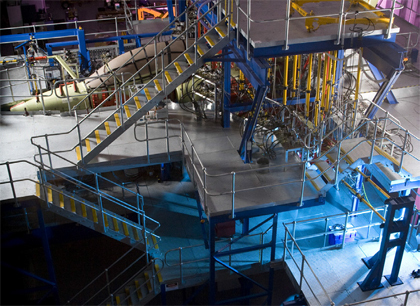 Apart from fatigue testing, the facility also houses a capability to undertake static fracture, composite hot/wet and corrosion tests, among others that can be applied to a wide range of materials of interest to Defence. The work enables determinations to be carried out on assessing the lives of many different components in service and most importantly the number of hours aircraft can be flown before refurbishment or retirement is necessary. The facility was instrumental in delivering cost savings of $400 million to Defence in relation to the fatigue life of the Royal Australian Airforce (RAAF’s) FA-18 Hornet fleet. This work determined that the aircraft could be safely flown without a major replacement of its central structure for the remainder of its planned life with the RAAF. In addition to serving Defence needs, the facility is being used by private companies for several types of testing, including fatigue testing components from new aircraft types, providing DST with a substantial income stream. Read more about how the centre supports air and maritime structures.